Janerol Supplies are an official distributor of Tygris products. We provide products in multiple packs to enable us to pass on larger discounts across the Tygris range. Is your concrete mortar breaking out? Try our truly resilient concrete repair & save time & money! Janerol Floor Resin a simple 2:1 mix epoxy that will repair holes, cracks and expansion joints in concrete floors. Once you have tried this you will never use a cement based repair again! Janerol Floor Resin a simple 2:1 mix epoxy that will repair holes, cracks and expansion joints in concrete floors. Order epoxy resin concrete repair. Janerol Epoxy Floor Resin Repair For a Repair that stays put! Less downtime equals greater output. Greater savings can be made by purchasing the larger floor repair kits! Order Janerol Epoxy Resin Concrete Repair online! Welcome to Janerol Paints, concrete repair and maintenance supplies! Everything you need for repairs, maintenance and janitorial supplies. Doing some building or maintenance work? Repairing the concrete floor of your warehouse or workshop? Janerol can supply the solution, from specialist mould and damp proof paints to concrete repair kits. Of course prevention is better than a cure so make sure your industrial machinery, metal fab and barriers has a coat of our High Quality One Coat anti-corrosive Gloss for steel and your surfaces are clean with our heavy duty universal wipes. 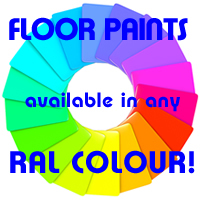 Discover everything you need when it comes to floor preparation in our list below; line marking and anti slip, epoxy mortar, enamel and rubber floor paints. We deliver orders fast and safe straight to your door. All within 2-3 working days, subject to weight. Don't forget to check our our special offers page for the latest deals. Look through our product catalogue by clicking on a catagory below or use the search box at the top of the page. Then select products to add to your shopping cart and complete the order by making a payment securely online. Want to know how to repair broken concrete? 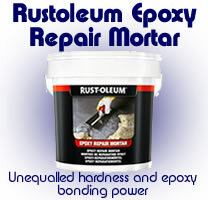 Choose from either epoxy mortars or resin. Paints from brand leaders suitable for concrete (epoxy or polyurethane) or tarmac for both internal and external use. A range of products for industrial maintenance and cleaning including cleaners, anti-seize, lubricant, release agents and sprays. Hygiene and maintenance wipes for the food and engineering industries. Maintain a clean environment anywhere. Simple solutions to ensure a good grip in either office or industrial environments. A range of products for use in vehicle maintenance such as engine cleaning and de-greasing through to car cleaning and air freshers. Below are a few of the recommended products from the Janerol product catalogue. Products include concrete repair kits, floor paints, metal machine barrier paint, mould and damp proof paints, wipes, hygiene and janitorial, anti slip, food safety, line marking, general industrial primers and more.